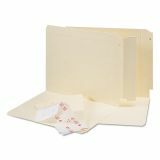 Smead End Tab Converters for Folders, 3 1/4 x 9 1/4, Manila, 500/Box - Self-Adhesive Tab Converters make for a quick and easy conversion of top-tab folders to end-tab folders for shelf filing. 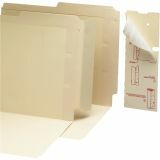 Great for folders being transferred from active drawer files to semi-active shelf systems. Wraparound design adheres to both sides of folder for added strength. The front panel is slotted to fit around a fastener. Removal of folder contents is not necessary for conversion. 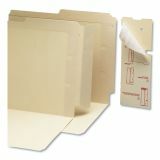 Top Tab Folders, Pockets, Jackets or Wallets.